Rakusan did not include the Fan Series in his main sequence numbering. Therefore, the original number used for each of the 36 Series prints has been modified to identify the Fan Series members of its theme. The five different fan silhouette shapes have been here assigned arbitrary numbers 1 through 5. To indicate a fan design these shape designations are added to the 36 Series number separated by a hyphen. In themes which contain duplicated fan shapes, one has been arbitrarily designated A and the other B. 104-4 indicates that this is a Fan Series design with fan shape 4 in the 104 Lily theme. Like all other designs in this series, 104-4 was only produced in a single print run, and few copies are currently documented. Rakusan began creating the Fan Series with a mixed set of designs whose signatures and seals suggest they were carved during the last half of 1933. Aside from a scattering of designs eventually used for later themes, the majority of these early designs were assembled into the first six themes of the series, including the 104 Lily theme. The 36 Series designs for all six were also completed and carved within that same short period. The 104 Lily theme is one of the many entirely regular themes represented by a complete fan quintet and a color woodblock print. Rakusan included at least two different kinds of lily in the 104 Lily theme designs, and clearly the defining subject is just 'lily' rather than any particular species. The Fan Series woodblock prints of the 104 Lily theme were distributed in early 1934 in installment two (of twelve). The delivery documents for installment two remain to be discovered, but its delivery month was either February, March, or April 1934, and the woodblock prints would have been printed during the same month as the publication. 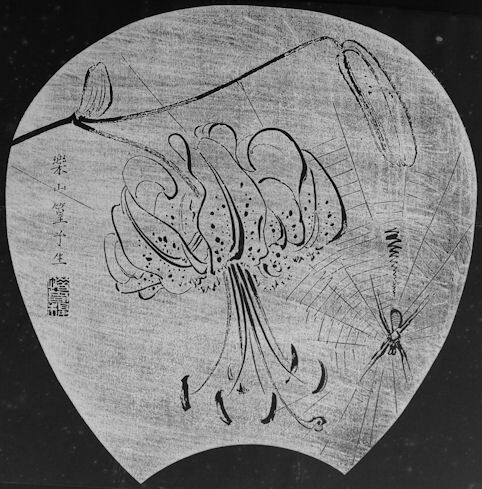 The composition of 104-4 includes a single tiger lily stem with one fully opened blossom, a leaf, and a closed bud. There is also a large orb spider in the middle of its orb web. All of the included elements are rendered as simple line drawings. Tiger Lily, Lilium lancifolium, 鬼百合, おにゆり, オニユリ, oni-yuri, lit. 'demon-lily' is shown in 104-4 and 104-2. Another name for tiger lily is 天蓋百合, てんがいゆり, tengai-yuri. The other lily designs in this theme (104-1, 104-3, 104-5, 104, and 69) have another native lily species, Bamboo Lily, Lilium japonicum, 笹百合, ささゆり, ササユリ, sasa-yuri, lit. 'dwarf-bamboo lily'. Like English, Japanese has a general name for any spider, 蜘蛛, くも, クモ, kumo. 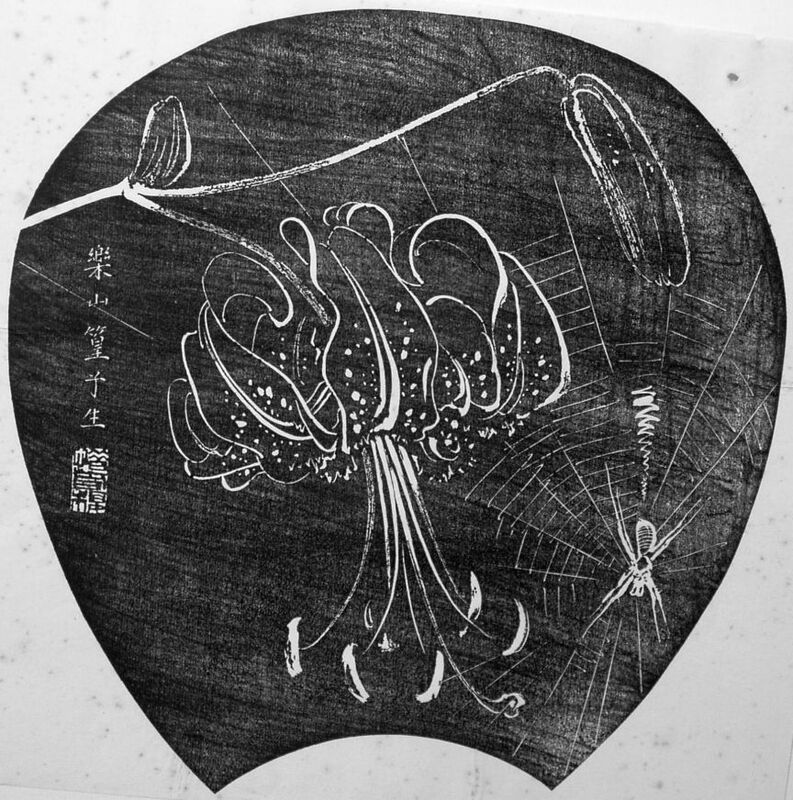 Rakusan rarely included spiders in his artworks, and only three woodblock print examples are known. The large spider shown in the center of its orb web clearly a kind of orb spider (family Araneidae). The striping on the body suggests Argiope amoena, 黄金蜘蛛, こがねぐも, コガネグモ, kogane-gumo, lit. 'yellow-gold spider'.